Matthew Finch has a long standing connection with some wonderful people in Sri Lanka who have devoted their lives to caring for under-privileged children. Matthew had been fortunate enough to visit Sri Lanka several times before the Tsunami in December 2004, so along with the rest of the world he was greatly affected by this tragic event, even more so as a friend of his had been caught in the Tsunami in Negombo Sri Lanka and was lucky to escape with her life and a few of her belongings. So in January 2005 Matthew (along with many other people) went to Sri Lanka to help where he could and he was involved in organising trucks to carry rice and water to be taken south to the more devastated areas. It was during this trip he became acquainted with Ron and Brenda Cornelius and Finch became involved with the Orphanage at Kochikade just outside of Negombo on the west coast of Sri Lanka. The money we send from Finch Group is sent to Ron and Brenda who ensure that it goes to the neediest. This has meant that over time we have become more involved with other orphanages within the Negombo area as well as St Joseph’s School for Deaf Children. Over the years we have paid for the refurbishment of kitchen facilities, bought mosquito nets and painted dormitories. 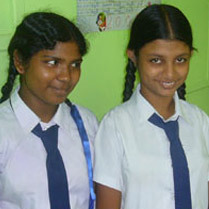 Education is very important to the people of Sri Lanka, so we have bought computer equipment and other educational materials too. Matthew goes back to Sri Lanka from time to time and he visits Ron & Brenda, the School and Orphanages whilst he is there and gets to see at first-hand how the money Finch sends is being put to good use.